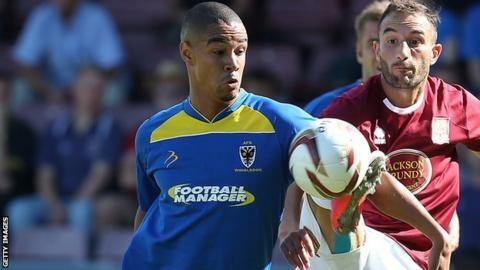 AFC Wimbledon striker Byron Harrison has joined Cheltenham, while the Robins have released captain Alan Bennett and striker Jeff Goulding. Harrison had been a target for Cheltenham manager Mark Yates over the summer and he has now secured the forward on a two-and-a-half year deal. The 25-year-old has scored eight goals in 26 games this term. Goulding, 28, has been with the Robins since June 2010 while defender Bennett, 31, is in his second season. "Jeff was one of my first signings and he has been great to have around," Yates told the club website. "He has been a big part of us over the last two-and-a-half years but he has a few things to sort out and this is the best deal for both parties. "Bennett has been a fantastic person and captain around this club. A club enquired about him in this transfer window but he didn't feel it was the right move for him. He rang me at 10pm this evening asking whether a deal could be done on the remaining period left on his contract and he leaves with my blessing and thanks. "Both have been good players for us and I would like to thank them for everything they have given us since being here." Skipper Bennett, who led Cheltenham to the League Two play-off final last season, had not played since their 5-1 FA Cup defeat by Everton on 7 January, while Goulding has made just seven starts this term.